Harish said they owe a lot to Chief Minister K Chandrashekhar Rao for granting the Medical College to Siddipet district. 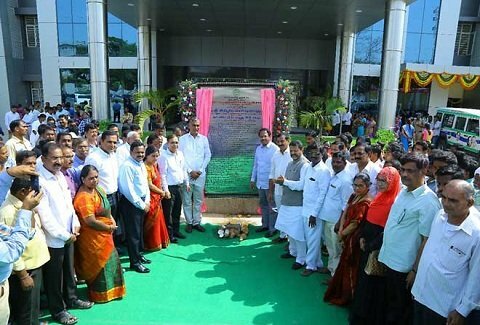 Siddipet: Health Minister C Laxma Reddy said setting up of a medical college would not have been possible without Irrigation Minister T Harish Rao’s efforts. Hailing Rao’s commitment, the Health Minister said the Irrigation Minister looked after every step personally to realise the dream of the medical college from 2018-19. After inaugurating the newly-constructed building of Government Medical College on the outskirts of the Siddipet town on Monday, Reddy said they had changed the existing procedures to meet the guidelines of MCI (Medical College of India). Terming it as a historical day in Siddipet’s history, Reddy said people of district would remember the day forever since it was going to change the face of the health sector in that part of Telangana. Harish said they owe a lot to Chief Minister K Chandrashekhar Rao for granting the Medical College to Siddipet district. Stating that the people of Siddipet and neighbouring districts would get best medical services free of cost, Rao said they could complete the construction of the five-storyed building in five months with the help of Health Minister, and Principal Secretary Rajeswar Tiwary. Principal of the college Prof Tamil Arasu presided over the meeting. MCI has granted 150 medical seats to the Siddipet college recently. Laxma Reddy and Harish Rao have also handed over pension amount to the victims of Filaria at a separate programme in Siddipet. Rao said that about 1,162 people would get Rs 1,000 pension in the district.